March’s CIA is Mindy DeFore, Head Teller at the Canton Pike branch. She was nominated for being a big driver in fundraisers that the bank does for local charities. She volunteers when we need help at another branch or covers a shift for a co-worker. Customers love her and compliment her all the time. She also picked up horse manure in the drive-thru. That in itself deserves an award. 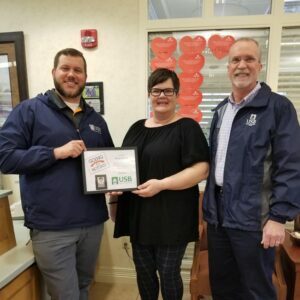 Pictured (l to r) are Andrew Wilson, Branch Manager and Loan Officer, Mindy and Randy Coombs, Christian County Market President.